It has been a long time since I baked any cake. Though V loves cakes, I hardly bake them anymore due to my busy schedule. All I am managing is to prepare some day to day food. Now, there were two reasons to even attempt this cake. One, we had a big batch of apples at home, which needed my immediate attention. Two, V was not keeping very well and he wanted to eat some cake. I thought of making this to cheer him up. My last few experiments with apple cake did not go very well. 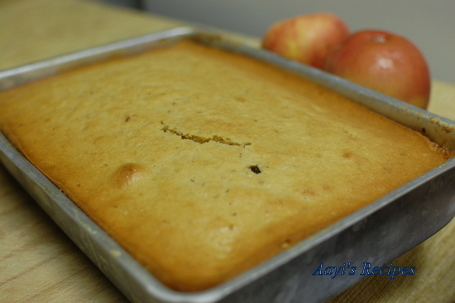 I wanted to make eggless apple cake(because I am sure that will be the first question from readers when I post this). We both don’t like dense cakes and the eggless cakes almost always turned out a bit dense. So this time, I didn’t even attempt to make it eggless. This cake came out pluffy and delicious. It tasted even better the next day. I am posting this here so that I can make this more frequently. The quantity of raisins can be increased by another 1/4 cup. Preheat the oven to 350F(approx 175C) for about 10mins. Cut the apple into small pieces and grind to a paste (do not peel them). To help in grinding, add the oil. Take apple paste in a big bowl and add sugar. Add vanilla extract, mix. Mix till it forms a uniform mixture. Add eggs mixing all the time. Sieve together baking powder and all purpose flour. Add little flour mixture at a time to apple mixture, mixing it all the time. Add the raisins and mix gently. Grease a oven proof dish and pour in the cake batter. Bake for about 45-50mins or till the cake it done. yummm! my mouth is watering…Thanks, Shilpa. I am going to make this tomorrow. the cake looks really delicious.I am going to prepare it this weekend.my son doesn’t like apples.hopefully he may eat this cake.the good part is the recipe contains oil which is always ther at home insted of butter.can I use soyabean oil? I have never used soyabean oil, so I can’t tell you more. If it does not have any strong smell, you can use it. Looks so good Shilpa..I have just started baking with fruits and I am loving it!! cheers and do visit whenever you can.. Such a simple cake – just the types I like – those red flecks of apple look pretty, a good reason not to peel them. The three eggs are a bit of a deterrent for me, but i hope to try it some time. Thanks for the recipe. One question, can I make this cake without eggs? 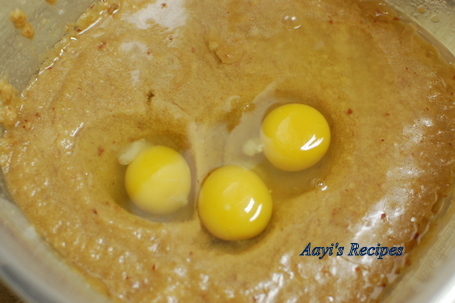 My whole family do not eat eggs and I love to bake this recipe. Can you suggest? Looks so nice and fluffy…yummy !! I make using overripe bananas..should try with apples !! Great recipe! One quick question though—What kind of apples did you use? Would 1 and 1/2 cups of sugar be much for sweet apples like Fuji apples? 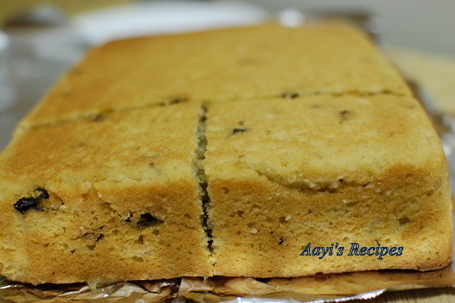 Cake looks moist and delicious.Nice combination of ingredients. This is gr8 ! I will definitely try it out. It falls in the same categoryas Nigella Lawsons Clementine cake I baked yesterday. I forgot to add the baking powder but it still turned out gr8. Hey such a wonderful recipe.I must try for my dear daughter!!! Which raisins did you use? The ones available here are the black ones. Are those ok or do I need light colored ones from Indian store? You can use anyone. I used black raisins. The vegetable oil you mentioned, can I use Sunflower oil instead.Please let me know. Want to try this cake. Yes. You can use sunflower oil. Wonderful recipe……..Can i use splenda instead of sugar???????? Can i use egg beaters that u get in store instead of eggs??? Thanks for sharing receipes……..
Apple cake looks yummm. so simple and your step by step instructions help a lot. bookmarked. 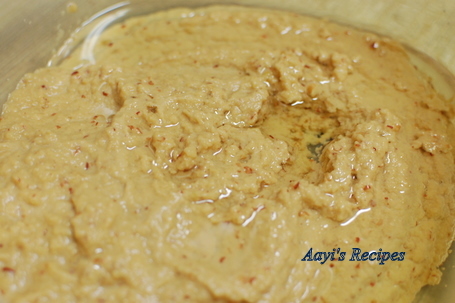 Your recipes are amazing … n m very eager to try this one. What size cake pan did u use for this ? Deepti, sorry, I don’t remember the size of the pan. Just make sure you are filling upto 3/4th or less in the pan to give it enough space to rise. Its a sure try for me , something very unique i have seen recipes of apple cake before (never tried one) but never with apple puree always with sliced apple pieces so i will try it and let you know. can i use our Indian regular red apples? Will it matter if the size of the apples change how is the consistency of the batter can i add milk to make it loose? sorry too many questions. Shilpa: Mahek, I think any normal sized apple should be good for this (I forgot to measure the weight 🙁 or in cups). Yes, you can use Indian apples. I haven’t tried adding milk, so you may have to try it out. Hi Shilpa, thank U very much for creating such a nice website. regarding the I have a question. I have convection oven and whenever I am trying to make a cake its not happening, the problem is that the upper part is getting too brown, the final product is a very hard sweet rusk. Please give me some suggetion! Looks like the temperature was too high. Keep it on a lower temperature and try. Tried this recipe and it turned out pretty good. My husband and two toddlers (I should say one of them is really fussy) gave it a thumbs up ! Thanks Shilpa. DO you think sugar can be substituted with jaggery or honey? The reason I ask is when I cook for my 17 month old kids I try to limit sugar as much as possible. I have read that jaggery and honey are better substitutes for sugar. Sorry, never tried any cake with jaggery or honey. you have quite a nice blog on recipes ! 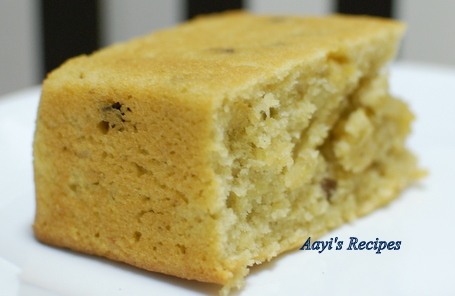 i have tried the egg less Dates cake. still, liked it, thanks ! going to try the apple cake today. IS VANILLA EXTRACT MUST or is it just for the flavor ? For flavor, otherwise it won’t taste good. tried this today…but was half cooked in the middle and also was dense…baked almost hour and half at 350..what might have gone wrong?can it be rebaked at a lower temperature so that it cooks evenly? Sometimes apples are very big, can you please tell me how many cups of pureed apple I should use ? I tried the cake & it was awesum !! Everyone in the house too liked it a lot . Credit to you 🙂 . I have been trying a lot of your recipes they are very good .But never commented . But really from the bottom of my heart I appreciate your enthusiasm . Even when u have a small baby you are updating the website regularly. Hats off to u.
hi shilpa . cake was awesome yummy!!! 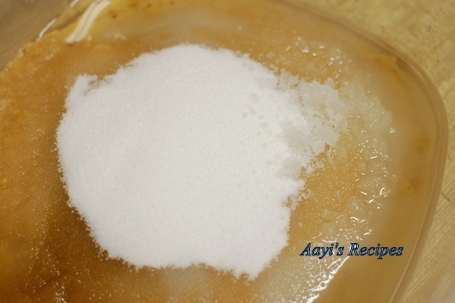 i had tried it with whole wheat flour and it worked very nicely ..
watz the water quantity used to prepare the cake ….?? 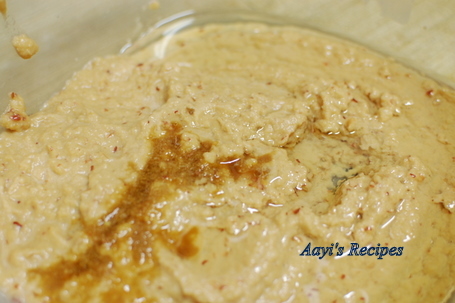 the mixture shld reach the level of chappatti batter or more liquid than that …..
Water is not used for this cake. I tried this cake today and it turned out very well (this is the first time i m bakin a cake :-)) , thank u very much for the recipe. Hey I have a Onida Microwave…guess it cannot be preheated….If the Oven cannot be preheated,can i make this cake? ?and if yes how much time shld i bake it then? I want to try this cake. When you say mix the eggs and other ingredients, do you mean mix with a spoon or use an electric beater? Please clarify. Your Apple Raisin cake is absolutely delicious! Can I make it with half a cup of raisins AND half a cup of walnuts, or would i have to add more oil/apples/something else in order to do that? Your advice would be much appreciated! This cake looks delicious and so spongy. Pls do send it and any other apple dessert recipes you have to C.E.D.D APPLES an event I am guest hosting this month. Thanks I am aregular visitor of your space, you have awonderful collection of posts. I have tried this recipe as soon as I saw it; I don’t bake a lot but always wanted to, and your simple recipes are really encouraging. The cake turned out beautifully and it is delicious! Great recipe! I tried this cake with whole wheat flour and added cinnamon powder as I didn’t have vanilla essence. It came out a bit dense but very tasty.